You can't go wrong with a dog whose name literally means, "curly lap dog". The Bichon Frise is a non-shedding, pure white, curly dog that's small enough to rest in your lap. Despite the short coat, the dog requires regular brushing and bathing as part of its grooming regimen. People with dog allergies will be relieved that the dog's coat is hypoallergenic. Bathe once per month and brush throughout the week to loose tangles and matted hair. Hints of Apricot and Cream are sometimes seen in the otherwise white-coated breed. In general, it's a small, happy dog with a lot of cheer and fellowship in nature. Its head looks like a giant circular ball of white fluffy hair dotted with dark eyes, a dark nose, and dark lips. This powder-puff dog is genuinely appealing because of its round tuft of white hair that looks like an Afro haircut. It's a sweet, little trooper that thrives on human company. The Bichon Frise has a 3 or 4-inch undercoat that's soft, silky, and smooth feeling. It's independent unlike some toy dogs, notably Chihuahuas. Some toy dogs have a problem with being dependent, jealous, or scared. This bold, lively, sweet dog will be your best friend, and it doesn't require every ounce of time you have. Furthermore, it doesn't bark too much or befriend only its master. It loves all visitors and strangers. ****They make a delightful and amusing companion. Gentle-mannered, sensitive, very playful and affectionate the Bichon Frise is good with children and other pets!! Height: 9 - 12 inches Weight: 7 - 15 lbs. Colors: White, cream or apricot up to 18 months of age. Coat: Long and loosely curling. Care and Training: The Bichon Frise requires daily coat care. Brushing, periodic trimming, and regular bathing. Trim around the eyes and ears with blunt nosed scissors. Clean the eyes to prevent staining. Most of their exercise needs can be met with just playing, but they do love to walk and romp in open areas. Learning Rate: Very High, Obedience - Very High, Problem Solving - Very High Activity: Outdoors - Medium, Indoors - Very High. Living Environment: An apartment is fine if daily walks are given. An owner of a Bichon Frise should be patient, consistent and be able to take time to train, exercise and socialize them. Bichon Frise do well with the elderly or disabled. Health Issues: No known heritable problems. Some problems with knees, block tears ducts, skin ailments, cataracts and epilepsy. The Bichon Frise descended from the Barbet or Water Spaniel, from which came the name "Barbichon", later shortened to "Bichon". The Bichons were divided into four categories: the Bichon Maltais, the Bichon Bolognais, the Bichon Havanais and the Bichon Teneriffe. All originated in the Mediterranean area. Because of their merry disposition, they traveled much and were often used as items of barter by sailors as they moved from continent to continent. The dogs found early success in Spain and it is generally felt that Spanish seamen introduced the breed to the Canary Island of Teneriffe. In the 1300s Italian sailors rediscovered the little dogs on their voyages and are credited with returning them to the Continent, where they became great favorites of Italian nobility. Often, as was the style of the day with dogs in the courts, they were cut "lion style." The "Teneriffe" or "Bichon" had success in France during the Renaissance under Francis I (1515-47) but its popularity skyrocketed in the court of Henry III (1574-89). The breed also enjoyed considerable success in Spain as a favorite of the Infantas, and painters of the Spanish school often included them in their works. For example, the famous artist, Goya, included a Bichon in several of his works. Interest in the breed was renewed during the rule of Napoleon III, but then waned until the late 1800s when it became the "common dog", running the streets, accompanying the organ grinders of Barbary, leading the blind and doing tricks in circuses and fairs. On March 5, 1933 the official standard of the breed was adopted by the Societe Centrale Canine of France. As the breed was known by two names at that time, "Teneriffe" and "Bichon", the president of the International Canine Federation proposed a name based on the characteristics that the dogs presented - the Bichon Frise. ("Frise" refers to the dog's soft, curly hair.) 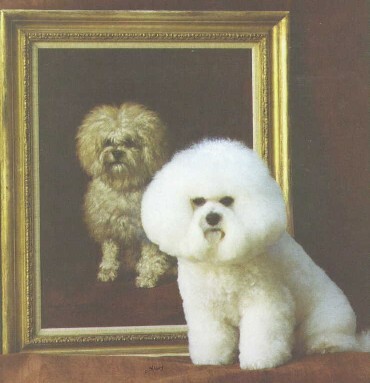 On October 18, 1934 the Bichon Frise was admitted to the studbook of the French Kennel Club. The first Bichon litter was whelped in the U. S. in 1956. In 1959 and 1960 two breeders in different parts of the U. S. acquired Bichons. This, then, provided the origins for the breed's development in this country. The Bichon Frise became eligible to enter the Miscellaneous Class on September 1, 1971. In October, 1972 the breed was admitted to registration in the American Kennel Club Stud Book. On April 4, 1973 the breed became eligible to show in the Non-Sporting Group at AKC dog shows.